Editor"s Comments: By 1976 Concours d'Elegance had become a regular event in Oklahoma Region. In fact, Roy Lopshire was appointed Concours Chairman, points were kept and year end Concours awards were presented. Roy wrote a monthly column for the Gazette, titled "Concours Contours. Here is the April edition, which describes a unique event. 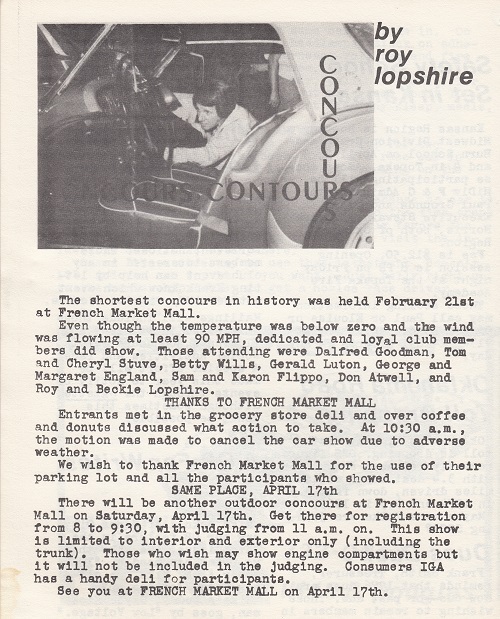 Five concours were held in 1976; This event in February, a stand alone event in April, the "Spring Games' in May, "Myriad Cavilcade of Cars" in August and the "Octoberfest" in October. Award winners for 1976 were Gerald Luton 1st, George England 2nd and Judi Anderson 3rd. The photo for Roy's column featured SCCA Area Six Governor Bill Johnson judging a TR3A at the 1974 Spring Games Concours.